Thermoelectrics — Vanny et al. Simply put, a thermoelectric device converts a difference in temperature across a material directly into electrical energy. Typically, you need a significant temperature difference to make this work, but if you consider existing infrastructure like power plants and nuclear plants, where significant waste heat is generated, there is a lot of potential for thermoelectric technology to increase operational efficiency! Another huge application of this technology is in space exploration. Harnessing energy from heat produced by radioisotopes, is crucial to energy efficiency in space exploration vehicles. Basically, thermoelectric devices can reduce the amount of fuel/batteries spaceships need to carry, increasing operational efficiency of the mission. Of course, with further improvement in this technology i.e. reducing cost and increasing accessibility, there is no shortage of potential applications. Cars, airplanes, trains, basically anything that creates heat can be made more efficient by harnessing additional energy from the generated waste heat. Neat huh? So how does it work? A thermoelectric device is composed of materials called thermoelectric conductors, these materials contain ‘charge carriers’ that move from the hot region of the material to the cold region of the material, resulting in a voltage difference that can be harnessed to do useful work. This phenomenon is generally referred to as the ‘thermoelectric effect,’ and it comprises of three different effects that have been observed by scientists in these materials. I will explain two of these (the important ones): the Seebeck effect and Peltier effect. As illustrated below, n-type thermoelectric materials contain free electrons and p-type materials contain holes (the absence of an electron). These carriers move both charge and heat, and are analogous to gas particles. If you put gas in a container with a temperature gradient, the gas particles on the hot end have more energy to move faster than particles on the cold side. Therefore, resulting in a buildup of hot particles on the cold side. This buildup of particles on the hot end will drive more particles to move back to the cold side to establish equilibrium. Therefore, the temperature gradient and the gas particle density gradient are acting in opposition till equilibrium is established. If the gas molecules are charged, there will be buildup of charge on the cold end, which will produce an electrostatic force that will push the charged particles back to the hot end. The potential (voltage) created because of this electrostatic force is known as the Seebeck effect. How a temperature gradient drives the movement of charge carriers, creating a potential. Experimental Observation of the Seebeck effect: in this experiment two different metal wires are joined together at two ends. It was observed that if the two wires were at different temperatures, a compass needle would be deflected by a closed loop formed by the two wires. A compass needle is deflected because of a magnetic field. The only explanation for a magnetic field being generated from a wire is that current is flowing through the wire! (*science detail here*) It was later explained by Han Orsted that the electron energy levels in each metal changed differentially, creating a potential difference at the junction that resulted in a current. Like the charged gas particles, the temperature gradient results in a build of charge that results in the creation of a potential to establish equilibrium. Experimental Observation of Peltier effect. In this model, two different conductors are at a junction. When current flows through the junction heat may be generated or removed at the junction. Woah what? I know. The Peltier effect and the Seebeck effect are observed conjointly. When two different conductors (in a closed loop) have a temperature difference, they generate a current (Seebeck effect), the flow of that current through their junction, will lead to heat transfer from the hot junction to the cold junction (Peltier effect). Therefore, the corresponding Peltier and Seebeck coefficients (parameter that measures a materials susceptibility to each effect) are directly related. Let’s illustrate these effects to get a clearer picture (photos courtesy Dr. Yinglu Tang). On the left in the figure below, is an illustration of Seebeck effect. 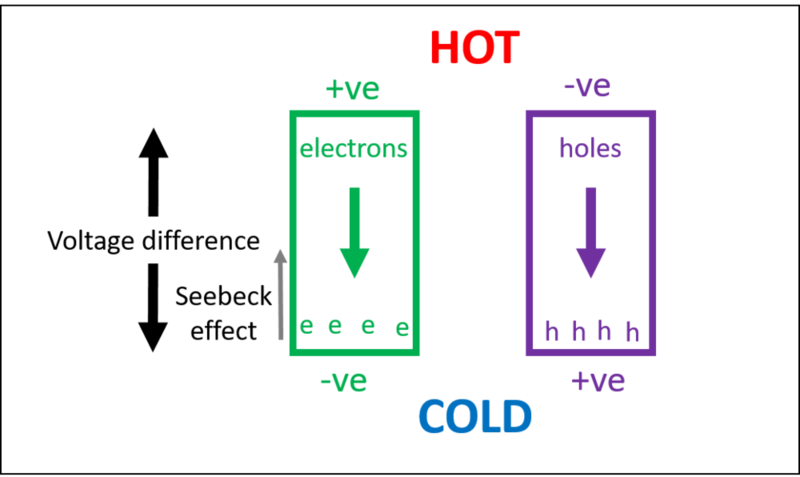 In the presence of a temperature difference ∆T, between a pair of n-type and p-type thermoelectric materials, an open circuit voltage V is generated. Thermal energy Qh can then be partly converted to work W. The ratio between the voltage and the temperature difference is called Seebeck coefficient S.
On the right is an Illustration of the Peltier effect. In the presence of an electric current i, a temperature difference across a pair of n-type and p-type thermoelectric materials is generated. The “Hot” side is attached to a heat sink so that it remains at ambient temperature, while the “Cold” side goes below room temperature. Electrical work W is consumed to move thermal energy Q. The ratio between the heat absorption/creation rate (Q) and the electric current (I) is called Peltier coefficient. η = energy delivered to electrical load/heat energy absorbed at junction. where Tc is the cold temperature and Th is the hot temperature, respectively. Currently, the best thermoelectric have reported performance values about 20-30% of the Carnot efficiency. Significant research is being conducted on improving the inherent properties of thermoelectric materials, so performance values continually approach theoretical maximum. Click the hyperlink in the text to learn more about these devices with a lot of potential!